When popcorn and choc tops get a little boring my friends and I set a challenge for ourselves, what is the most crazy and delicious ‘outside food’ we can get away with bringing into a cinema? Pizza? Burgers? Burritos? Chicken? Churros? 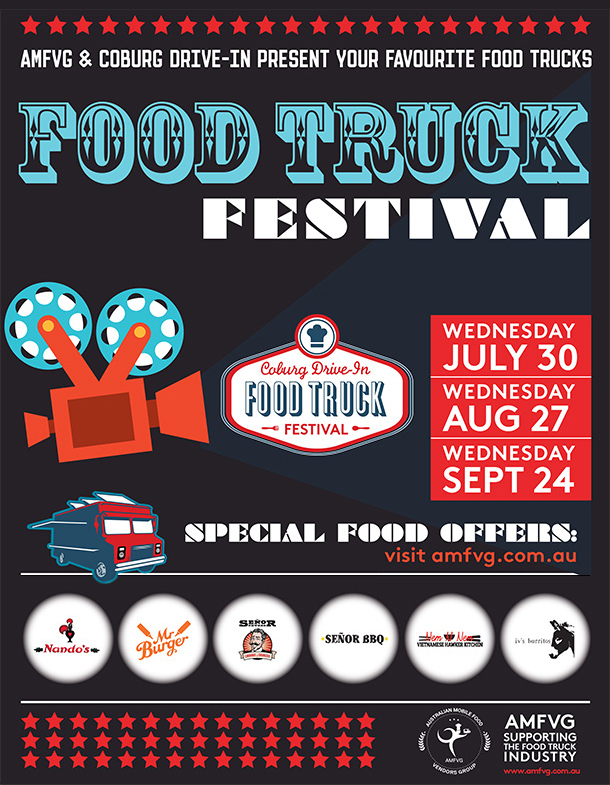 Coburg drive-in cinema is now providing movie-goers with an ‘outside food’ free-for-all, offering the most tasty movie time bites at their monthly food truck festival, once a month during July, August and September on Wednesday nights from 5.30 starting tonight! Grab a carload of friends, and purchase a ticket to any of the movie sessions playing on the night to join in the fun and watch a flick (or two) on the largest screens in the Southern Hemisphere from the comfort of your own car (car boot pillow forts optional) while chewing on your favourite foods from Iv’s Burritos, Mr Burger, Nandos, Señor Churro, Nem N’ Nem Vietnamese Hawker Kitchen and Señor BBQ. Where: Coburg Drive-In, 155 Newlands Rd, Coburg VIC.